Kerala LLB Law entrance exam 2014 (KLEE) admit card is now available for download at CEE website. The hall ticket for LLB 5 years entrance exam scheduled to be conducted on 28th June 2014 should be taken to the examination Hall to get admittance. Read more to know about the Kerala Law entrance exam 2014. The admit card for Kerala Law entrance exam 2014 (KLEE) is now available at CEE website. Candidates who have applied for the Entrance Examination for Admission to Integrated Five Year course 2014-15 which is scheduled to be conducted on 28th June 2014 can download their Admit cards from the official website of CEE, www.cee.kerala.gov.in from 21st June onwards. This admit card or hall ticket should be produced at the exam hall to get admittance. To download the Admit Cards, candidates should have to enter their Application Number and Date of Birth on the specific page of the website. 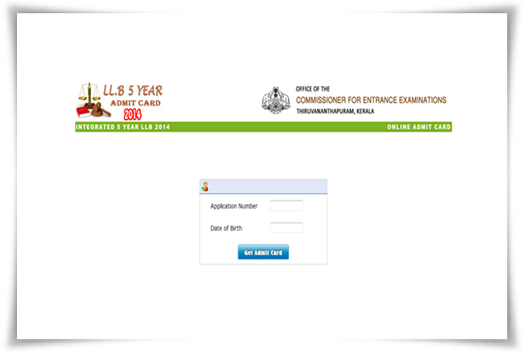 Later click the 'Get Admit Card' link which would let you download the Admit Card. As the Admit cards will not be sent to candidates by post, applicants must use the online portal to get their admission ticket. The results of some candidates are withheld due to some defects in their applications. They could rectify the defects through a process given in the website. After rectifying the defects, such candidates have to submit the relevant documents to this office before 5.00 pm on 25th June 2014 by hand/ speed post/ registered post. The centre wise list of candidates with their addresses and application numbers is also available on the portal. The answer keys of the entrance examination would be published by the first week of July while the provisional rank list of candidates who have qualified in the entrance test will be made available by the second week of July 2014. As next step of admission procedure, the Centralised Allotment Process for admission in Government Law Colleges and Private Self-financing Law Colleges of the state would be conducted. Applicants can modify and make the necessary changes in their option registration before the stipulated time. Candidates for the Entrance Examination scheduled for 28th June can download the Admit Card from 21st June 2014. As the admission ticket is available online, students can get access to it with ease. Do not forget to carry the hall ticket as it is necessary to attend the exam.